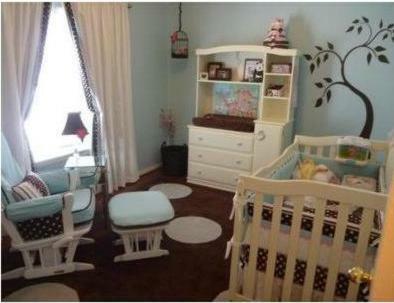 Kitting out room with baby furniture is an expensive proposition, and there are plenty of takers for your money! You will be bombarded with sales messages from every side over the next few months, each of them more convincing than the last. It's important that you be well aware of your furniture options and requirements before you head out on that shopping spree that you are so looking forward to. Doing the research before you buy is not the most exciting part of getting ready for baby, I know, especially if the nesting instinct has kicked in. As my hubby would say, you get a sudden and irresistible case of the buy-ees - and it won't wait! Hopefully you have found this site in time, because I have done all the hard work for you. By the time you have finished browsing our baby nursery furniture pages, you will have a good idea of what furniture items you need and which are nice-to-haves, as well as, where to put them in the nursery and what to store in them. Do you have an all-time favorite, absolutely must-have baby product or furniture item to tell us about? Send us a review to add to the baby gear or nursery furniture section of this site to help other parents to find the BEST baby stuff for their little ones. You'll receive a FREE ebook as a token of our thanks. Take a quick look at the nursery furniture checklist to make sure you've got all the bases covered! There are basically nine types of crib. Crazy - I know! Get the basic run down with advantages and disadvantages, descriptions and brand information about baby cribs. 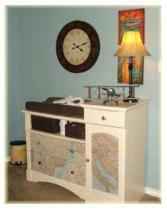 Small baby beds include baby bassinets, cradle and moses baskets, as well as bedside cribs and the Amby bed. Your baby's changing table will be very, very well used over the next 18 months or so. So how do you know which type will be best for you? On this page you will find out what to look for in a baby changing table to make sure that it's affordable, safe and comfortable for baby and easy for you to use. Everything you need to know before you buy your nursery rocker or glider chair. Which type of rocker is best for your baby nursery? The nursery rocking chair has been part of our lives for hundreds of years. Most of us have memories of the old nursery rocker our mothers' raised us in. These classic, simple pieces of furniture hold sentimental value for so many. Imagine how you will feel rocking your very own baby to sleep in one - time really flies! The nursery glider is relatively new, in comparison to the traditional nursery rocking chair, and has become very popular over the last few years. The horizontal, floating movement is effortless and relaxing - If you haven't rocked in a nursery glider chair before - try it - you're in for a real treat! There are numerous other nursery furniture options besides the standard baby crib, changing table and nursery rocker found in most nurseries. Take a look at this list of other nursery furniture to get ideas for other nursery furniture items you can use to jazz up your space. In amongst all the excitement you may be feeling a mild - or not so mild - panic setting in. Follow these nursery interior design tips to find out how to place the furniture in your baby nursery to achieve a harmonious and functional nursery design. I wandered through the baby shops looking at all the wonderful baby products, and the only thing going through my head was, "Where on earth am I going to put all this stuff?" Use these unique nursery furniture space saving tips to help you to squeeze more square inches from your space. If your budget is tight, there are numerous discount baby furniture ideas available for saving money. From shopping online to catching the sales plus a few other money-saving secrets! Baby furniture safety should be a primary concern in the baby nursery, therefore baby nursery furniture items should always be selected with baby protection in mind. One would think that when it comes to specifically designed baby room furniture, safety would be guaranteed, but this is not always the case. Each year, in the US alone, 92,000 babies sustain injuries, severe enough to warrant a trip to the emergency room, in incidents related to badly designed baby nursery furniture. It is vitally important that you are aware of every recent baby furniture recall so that you can avoid buying this furniture, or using it if you already own it. This baby nursery furniture recall report covers all changing table, dresser, toy chest, storage bin, table and chair, beanbag and bunk bed recalls.